Mums’ most loved crib, the Chicco Next2Me, is now available with even more features to ensure you and your baby sleep closely and comfortably all night long, without being in the same bed. 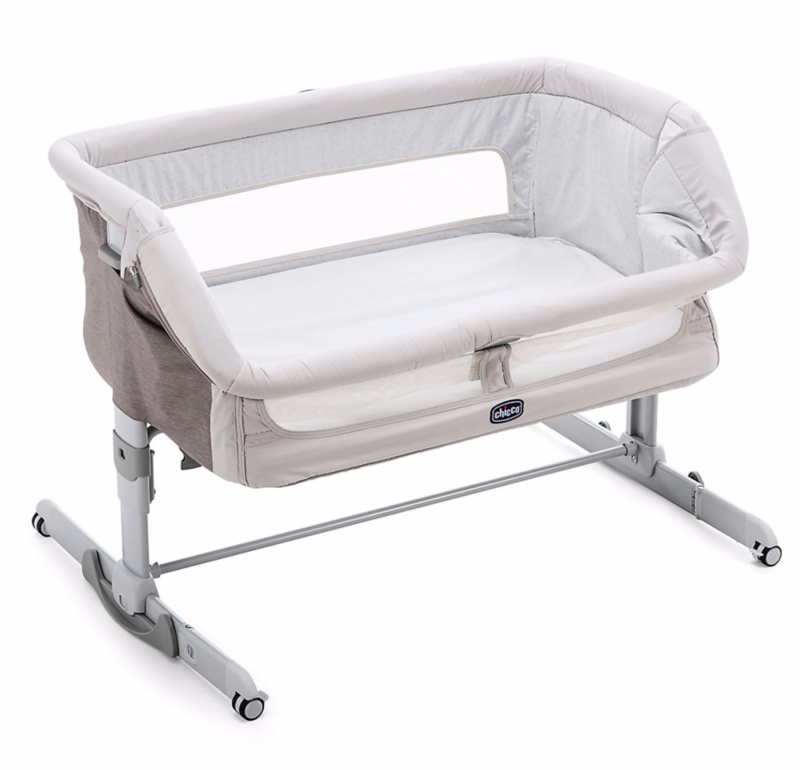 The new Chicco Next2Me Dream is the only side sleeping crib on the market to feature a simple one hand opening panel, allowing you to switch from a stand-alone crib to a side sleeping crib quicker and simpler than ever before. The cocooning crib has padded sides and comes with a soft mattress for extra comfort and it also boasts a new rocking mode, activated by just the click of a button, which allows parents to easily soothe their baby and keep them calm and peaceful while they sleep. Furthermore the 11 height levels, ranging from 35cm to 52 cm, allow you to create the perfect sleeping position for your little one whatever bed you own. In addition it will have an additional mesh window for increased breathability to keep your baby cool and comfortable and now has 4 wheels with brakes for improved manoeuvrability. The Chicco Next2Me Dream is available in three beautiful new designs with matching bedding and sleeping bags available; Delicacy, which is a soft grey with elegant dandelion design, Fairytale a pale blue adorned with a cute bunny print. It also comes with a handy storage bag included allowing you to easily transport your Chicco Next2Me Dream with you wherever you go. Chicco Next2Me Dream joins the already existing original Chicco Next2Me and range of Next2Me accessories including bed sheets, a reversible sleeping bag and a mattress cover to offer the ultimate sleeptime solution for mums. For more information on Chicco products, visit www.chicco.co.uk or connect with Chicco on Facebook at www.facebook.co.uk/chiccocompanyuk. Finally – A Wedding Dress For Pregnant and Nursing Mamas!